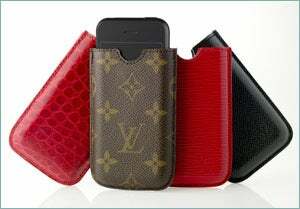 Status-obsessed women can now drop more cash in the name of staying 'stylish' by accessorizing their iPhones with Louis Vuitton carrying cases, being sold exclusively at the NYC Vuitton 5th Avenue flagship starting Monday. The cases range from $225 for monogrammed canvas to $1120 for alligator skin. Which, yes, means a case can cost you close to, if not twice as much, as your stupid, new, possibly outdated electronic toy.